In the first book of the Bluegrass Series, McKenna Mason, a New York City attorney with a love of all things Prada, is on the run from a group of powerful, dangerous men. McKenna turns to a teenage crush, Will Ashton, for help in starting a new life in beautiful horse country. She finds that Will is now a handsome, successful race horse farm owner. As the old flame is ignited, complications are aplenty in the form of a nasty ex-wife, an ex-boyfriend intent on killing her, and a feisty race horse who refuses to race without a kiss. Can Will and McKenna cross the finish line together, and more importantly, alive? Twenty-Nine year old McKenna Mason finds herself in a sticky situation when she and her best friend Danielle witnesses a crime in action at their work place, which happens to be a big time law firm, and decide to make a plan and split up. Kenna ditches her New York life for a nice glass of sweet iced tea in Keeneston, Kentucky. Or should I say a nice tall glass of smokin’ hot Will Ashton, her first kiss and first love? Kenna seeks out Will for help getting a job as DA, but soon seeks for more when she realizes she's still head over heels for him after 17 years. Honestly, I thought the connection between Kenna and Will sparked way too fast for my liking, but I will not turn down romance in a book, even if it’s too corny! The characters in the book will make you feel like you’ve known them forever, just don’t let all the winking creep you out. 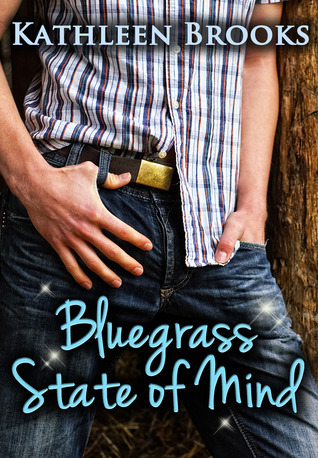 ;) With Kenna keeping a secret and Will trying to figure out who is trying to sabotage his farm, not to mention a greedy ex-wife and a town that knows everything about your love life before you do, you can be assured that this book will keep you turning the pages. Aside from the grammar errors, I thought this book was a good read. I don't believe there was any character in this book who has gone unnoticed, even if they were only there for a page or two. Now, what I didn't like. I didn't like the instant love connection between Will and Kenna, it was cute, but didn't seem real to me. It felt forced. I would definitely recommend this book. If you love yourself some lighthearted romance with a bit of mystery then you should read Bluegrass State of Mind! Up next, we have Dani (Kenna's best friend who was also in the same predicament as Kenna, but stuck around to track who was after them) and Mo's story! I absolutely love Motahdi Ali Rahmen, who is a modern day prince, and his head of security Ahmed! Thank goodness there are more books to this series, because I couldn't get enough of them.